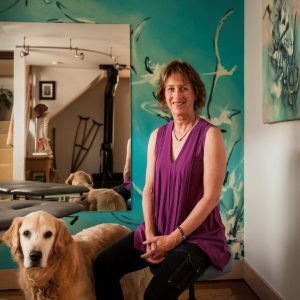 Karen Church is an athlete, avid learner, seasoned physical therapy clinician and entrepreneur. She first studied at Queen’s University where, in 1985, she had the opportunity to be an exchange student in Human Movement Studies at Carnegie University in Leeds, England, and graduated with a BPHE from Queen’s in 1986. Immediately she moved on to the University of Toronto and graduated with a B.Sc.PT in 1989. Karen was the Co-Valedictorian for her year and also received the Beatrice Hally Award of Merit for Leadership. For her independent study course she authored: Setting up a Private Practice in Ontario which became an official publication for the Ontario Physiotherapy Association, Toronto, Ontario, Canada – 1989. Karen to this day has not stopped her education as evidenced by her studying at the Institute of Physical Art. She has and continues to integrate knowledge gained from all aspects of her life into her private practice in Colorado which she established in Glenwood Springs in 1998. Karen is certified in Functional Manual Therapy™, a distinguished honor held by less than 300 physical therapists in the United States. She integrates Functional Manual Therapy™ (soft tissue and joint mobilization, neuromuscular re-education and motor control) which is integral to her private practice as a physical therapist and also has been incorporated into the community classes at the Providence Apothecary and Hot Springs Pool where function, sports performance and injury prevention is emphasized. Karen’s yoga background is impressive. She has studied with numerous senior Iyengar teachers beginning in 1993 and became an Affiliated Anusara Instructor in 2004. She is passionate about Ayurveda and an avid continuing student of Dr. Robert Svoboda. She teaches Therapeutic Yoga – Anatomy and Wisdom Warriors: Yoga over 50, a12 hour workshop training program, with nationally acclaimed yoga instructor Desirée Rumbaugh. Karen provides “personalized physical therapy and yoga” in her clinic and onsite consultations at clients’ homes, workplaces and recreation venues. Mindfulness is not a new concept to be integrated into clinical practice for her as she values it as an integral part of clinical practice which aligns with her understanding of health and well-being. Karen is a student, teacher, photographer and producer of educational media. Her published work: Therapeutic Yoga (ISBN 0-9741796-1-2) which integrates physical therapy, yoga and self-care for the human body shows how her continuing educational pursuits have influenced her practice. Karen, an experienced physical therapy practitioner, uses her integrative thinking ability to enhance “hands on” care for her clients in Glenwood Springs and beyond ……… physical therapy at its best! Morgan is a therapy dog and works at Karen’s home office in Glenwood Springs, CO.